With series two of hit Netflix show Stranger Things launching today, Snapchat, Shazam and Netflix have worked together to give fans a portal into its world. 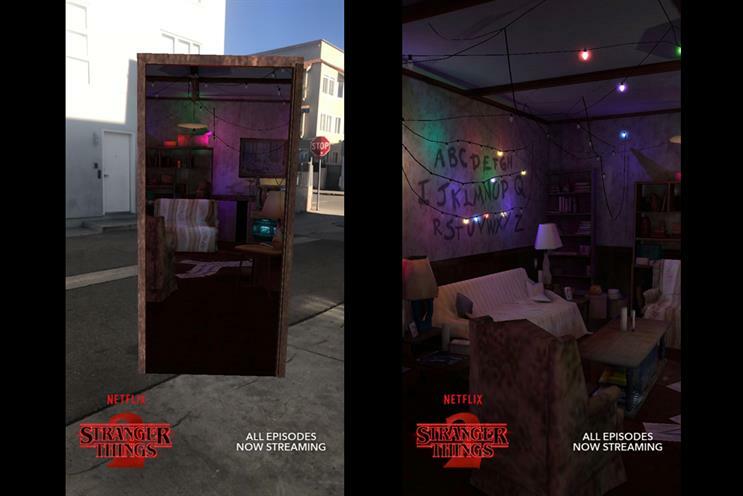 The "portal" World Lens lets users walk through a door into another world, in this case, the "Upside Down" version of Stranger Things character Joyce Byer's living room. Within this AR experience, users can move around inside, be surprised and even peer back through the door into the real world. The Portal World Lens only works on iPhone 6S and above with iOS 11 installed. To unlock the Lens, users will use Shazam, within Snapchat, when the Stranger Things theme song plays. For Snapchatters with older iPhones, or any other OS, the platform has a face lens that mimics Eleven's (another character from Stranger Things) nosebleed. And if they flip the camera around, they will see Byer’s living room in an interactive "gyroscope Lens" - making it a similar experience to the portal, minus walking through the door. To find the interactive easter eggs, users should tap objects in the room. A third lens will be made available in the UK via Snapcode today at 8am when Shannon Purser (Barb) will take part in a Stranger Things binge-watch party with fans at Topshop’s Oxford Street store in London. This World Lens will place users at the swimming pool where Barb went missing in Stranger Things' first series.